My husband had to travel across the ocean for work recently and fell in love with Indian food while he was away. So much so, that he insists on taking me out to an Indian restaurant on our next date! Can’t say I mind…. In the mean time, I thought I’d experiment with traditional Indian flavors at home, and this low-carb, dairy free, gluten-free, Trim Healthy Mama-friendly Chicken Vegetable Curry is a dish we both thoroughly enjoyed! You can serve it “as is” for a wonderful S meal, pair it with 1/4 cup or less of brown rice or beans for an S Helper, or a full serving of brown rice or beans for a Crossover! Made without any special ingredients, this Chicken Vegetable Curry is an extremely versatile recipes. You can adjust the amount of spice to your own liking, and add in whatever non-starchy vegetable you like. Peppers, a handful of chopped tomatoes, sprouts, green beans, and asparagus would all work well in this recipe, too. Carrots are usually considered an E vegetable on the Trim Healthy Mama plan, but they can be used in a garnish amount in an S setting. This Chicken Vegetable Curry recipe only calls for one carrot, which works out to a garnish amount per serving. If you choose to serve this as a Crossover over brown rice or beans, you can add starchier vegetables like sweet potatoes and corn to your curry, too, and use as many carrots as you’d like. The canned coconut milk should not be substituted with coconut milk or any other nut milk from a carton. You need the consistency of canned coconut milk for the right creaminess in your curry. 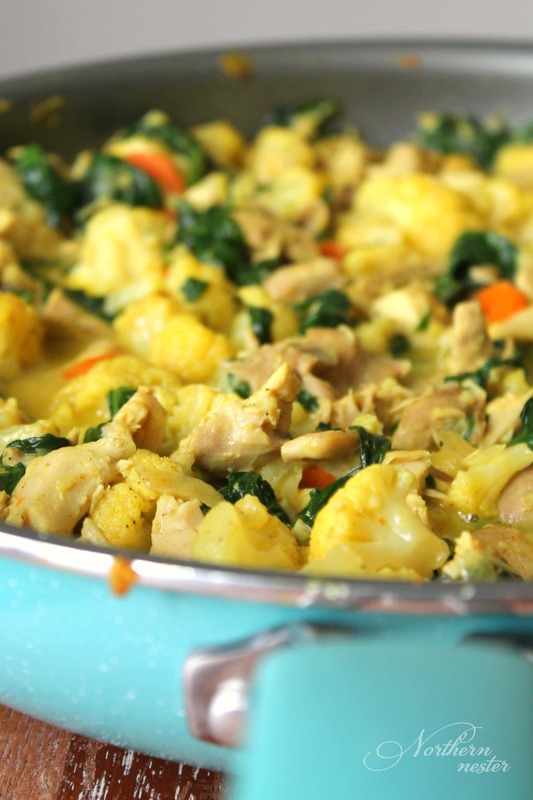 If you love Indian food, you will love this low-carb THM S Chicken Vegetable Curry that's also free of dairy and gluten! Creamy, flavorful, and no special ingredients required. In a large saucepan or skillet, melt coconut oil and saute onion, cauliflower, and carrot together with curry powder, mineral salt, ground pepper, and cayenne pepper. When vegetables are tender-crisp, add in garlic and cooked chicken, sauteing briefly. Pour in canned coconut milk and chopped spinach leaves. Cover and bring to a simmer. Enjoy! I had something similar to this at P.F. Chang’s and they added butternut squash and tofu. Does that keep it in the “S” category? Thanks!